Jim, your Winter Season captain (November, 2018, through February, 2019), is a Canadian who grew up sailing on Lake Ontario. His family has always owned boats and Jim began his sailing instruction while attending summer camp. As a young adult Jim moved to Virginia, were he became bare boat certified and began chartering. In his corporate life Jim was a stockbroker. He was televised on Charlottesville, Virginia’s NBC 29 nightly news for seven years sharing his market commentary with viewers. While working as a stockbroker, Jim found time to become a delivery captain for a Lagoon catamaran dealership, and began transiting the East Coast of North America. There he found his love for the open ocean. He obtained his United States Coast Guard Masters License, and later obtained a MCA 200-ton Offshore Certificate. Jim is also a certified PADI Dive Master, and looks forward to taking you diving. In addition Jim enjoys windsurfing, kite surfing, and skiing. Amanda, your Winter Season chef (November, 2018, through February, 2019), is from Virginia. She grew up as a competitive swimmer and spent time backpacking in the Blue Ridge Mountains. Later, she discovered triathlons, and spent many hours training and competing. Jim introduced her to sailing, and life was never the same. She began sailing the Chesapeake every weekend, and accompanying Jim on some of his deliveries. Amanda’s career as an engineer was demanding and gratifying, but soon she began dreaming of warm waters. During her years sailing the Caribbean, she developed a love for cooking and exploring local cuisine. To prepare for life as a charter chef, Amanda attended a mega-yacht cooking school in Fort Lauderdale, where she honed her skills. She looks forward to serving you beautifully presented delicious meals. In addition, Amanda is a certified PADI Dive Master, and a kayak instructor. Amanda’s other interests include windsurfing, kite surfing, and skiing. After residing in the Caribbean Islands for 13 years, Jerry is a good source of local knowledge and history which ensures every trip is unique, fun and interesting. He is gregarious and loves meeting people. COPPER PENNY can accommodate 6 guests in 3 cabins. The Master cabin has a queen size bed, shower and toilet. 2 Guest cabins each have a queen size bed, shower and toilet. COPPER PENNY is fully air conditioned through out. Crew has a separate heads and shower. Coconut crusted chicken on blackbean & baby tomato salad cups, drizzled with lime aioli. To say we had an amazing time and loved everything is an understatement. Jerry & Dawn were wonderful hosts and did everything we asked for and more. We had an idea of things we wanted to see but their knowledge of the area was a huge plus to help us craft the most enjoyable itinerary. Even though the BVI is still recovering from the awful hurricanes of last year we thoroughly enjoyed the weather & water activities, Scuba diving & seeing some really cool stuff. We all felt comfortable with Jerry's expertise to provide fun experiences but more importantly, safe ones. Dawn's meals & Jerry's cocktails were highlights of the trip. We enjoyed variety the menu offered. Meeting our dietary special needs isn’t easy for anyone, Dawn took it in her stride and never made us feel like it was a bother. Copper Penny was a beautiful vessel with many comforts of home. We all enjoyed our rooms, the dining areas & especially the bridge up top. It was great fun to sit up there enjoying the quiet of the sail while reading or listening to Jerry fill us in on areas we saw or watching the crew at work getting the sails in place and back again. We would highly recommend the team of Dawn & Jerry aboard Copper Penny to anyone looking for a bucket list vacation. Jim and Amanda were awesome. They are great people and were superb hosts. We found them to be very knowledgeable and they were always willing to answer our questions and provide information about what we were experiencing. They also struck a perfect balance of attentiveness without being overbearing. That was an amazing and memorable trip. We would highly recommend Jim and Amanda and the Copper Penny for anyone looking for a fun and relaxing adventure. This was our second charter with Jim and Amanda and it was fabulous. Words cannot describe how perfect our trip was. The two make you feel at home and are there for your every need. Jim took us on some of best adventures that anyone could dream of and Amanda could not spoil us enough with her food and drinks. When my husband and I, kids and friends, look back on these trips, we cannot help but smile and reminisce about the great times we had. 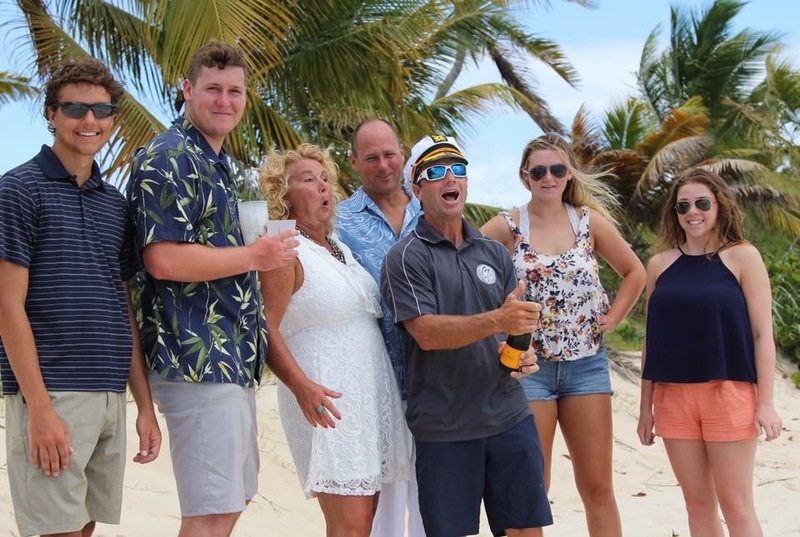 Jim and Amanda have made each trip special; we were even blessed to have Captain Jim officiate our 25th wedding vow renewals on Anguilla. They are not only a captain and first mate to us, they are good friends. I guess to sum it all up - We are booking another trip with these two...that should tell you how awesome it was and how awesome they are! • Was the crew friendly & accommodating? Exceeded all expectations. Jim and Amanda were professional, friendly and attentive to all passengers needs. They even took us on some special side trips that added immensely to the overall experience. • Was the yacht comfortable & clean? COPPER PENNY was pristine and well-maintained throughout. The large flybridge greatly expanded living area. • Was the food good & well presented? This is the area that blew us away the most as Amanda delighted us at every meal with gourmet fare presented beautifully. This was truly over-the-top quality. • Do you feel your vacation lived up to the expectations set by your Broker? • Additional Comments on your charter. I would not hesitate a moment in recommending COPPER PENNY and Jim and Amanda. Was Copper Penny comfortable, clean and well ventilated? What was your favorite aspect of the yacht?Copper Penny was impeccable!!!! Jim and Amanda take pride in keeping her clean!!! I literally walked up the stairs one night around 9:00 after forgetting something and found Amanda on her hands and knees scrubbing the kitchen floor!!! What a testimony to an extremely strong work ethic!!! It's hard to say what the favorite aspect was but I will say as a group we seemed to gravitate to the fly bridge with its gorgeous views and wonderful breezes. Just fun hanging out with Captain Jim too!!! Was the food enjoyable and well presented? Did the chef customize the menu to your preferences?The food was simply amazing!!! Not only was it scrumptious but the presentation was most impressive!!! We basically didn't have limitations on our preference sheet and we're open to trying new dishes. Amanda even baked us a chocolate cake with each of our Anniversary years written on top… such a thoughtful way to end the celebratory trip. The impressive thing is she was always in a mode of preparation for our next meal and I would observe her cooking through even (what we considered) rough waters… she never missed a beat!! Did you enjoy the itinerary and the area you sailed? We found each day unique and interesting !!! Jim planned just the right mixture of beach walking, bar hopping, snorkeling, hiking, shopping, floating, skiing, kayaking, and simply vegging, drinking adult beverages, listening to our favorite tunes, enjoying conversation and observing a part of God's creation we had never experienced with our lifelong friends and our new friends, Jim and Amanda!! We are all six interested in a repeat trip together with Jim and Amanda in the next three years. Stanley and I are in the process now of trying to organize another group for next January, hopefully the same week or at least around the same time. This trip would be a little different in that it could be some of our customers/friends. The trip last week was our very best friends with whom we've traveled for years. The upcoming trip would be with folks we have never traveled with so that's a little caveat of sorts in my mind in planning….The only potential change we would make is to eliminate the first night stay in St Thomas. With earliest possible flights out of Jackson and connecting flights into St. Thomas it may be impossible. However, the money we spent in St. Thomas could go to an extra night on the boat if we could make it happen. The food: Beyond expectations. We can no longer fit into our clothes. Bryan and Ava could not have been more accommodating and welcoming!! All were so pleased with all aspects of the trip that they tried to figure out a way to bring Bryan and Ava home with us!!! Kent and I had a wonderful time during our week with you. Our memories and adventures will last for many years to come! The food was beyond 5-star Ginny….truly impressed! You both took such good care of us and made sure our every need was met. We had such a good time snorkeling, sailing, paddleboarding and just hanging out! How can we top this! It’s been such a great trip with great people. Good times! Fantastic food! Such a memory of a lifetime! The mix of activities: snorkeling, hiking, shopping, visiting local bars. Gord and Ginny’s individual attention to the interests of our party made it a vacation tailored just for us! A great Captain, a fantastic Chef! Perfect people to place your vacation and leave all the details to them. Thanks Gord and Ginny for being the best! Thank you so much for such a wonderful trip through the BVI. It has been such an amazing sail accompanied by exceptional food and drink. Your hospitality and generosity has truly made this an unforgettable vacation and we cannot thank you enough for all you have done for us. Hope to see you again in the near future. From the girls! What a fabulous trip! The two of you helped to make each day memorable. Great snorkeling and superb food. My best trip ever! I would go anywhere with Gord and Ginny – Thank you so much for all your hard work. Your attention to detail was amazing. We are so happy for this trip to remember – you made it special! Thanks Gord & Ginny so much for a terrific week in the BVI. The food and presentations were worthy of a 5-star restaurant! Your hospitality and professionalism was exemplary. Thanks for taking us to great places for entertainment. We are a group of old friends and we now consider Ginny & Gord old friends also. Having travelled the BVI before, we appreciated things we’d never seen before and new adventures. Thanks for helping us make great memories. We look forward to cruising with you again very soon. Love you guys. Thanks Gord and Ginny for an amazing week away from the maddening crowd. We are grateful for your part of our great escape. WE WILL BE BACK!!! Thank you both for a great week in paradise! The attention to detail and ALL THE WATER TOYS made this week FANTASTIC! Thanks Ginny for the amazing food and hospitality, and Gord for organizing our kayaks, paddleboards, windsurfs, skiing, wakeboarding and sailing. Adventures beyond all of our dreams! May the best of winds be in your sails and we hope to see you again soon either in paradise, or in Switzerland. We truly enjoyed every minute of our trip on Copper Penny! Thank you for everything - the food was wonderful and we loved hearing the travel stories. You both took very good care of us and were excellent hosts! We had a blast and a wonderful honeymoon. Gord & Ginny, Thank you for an amazing, unforgettable week full of adventures and relaxing - the vacation of a lifetime! From the sailing to Willy T's to Foxy's and all the way to the Bitter End - it was all new to us and we will never forget it. And we will never eat this well ever again - the food was absolutely awesome. Thank you so much! Thanks so much for an amazing Christmas adventure! We all loved the Christmas secret package game! Ginny, thank you for all the yummy food and for taking such great care of us! Gord, you are an amazing captain. Thanks so much for showing us the best of the BVI. We had so much fun and will NEVER forget this wonderful vacation! Thanks so much for an amazing week. Ginny-your cooking is incredible and Gord-you made this such a relaxing adventure. We had fun learning about the BVI and playing games with Ginny. What a fun week with great friends and the best way to celebrate our 20th! What an incredible way to celebrate our 20th Anniversary, right down to the special cake and champagne too! Thanks for sharing stories of your sailing experiences and your knowledge of the BVI. The snorkeling was unbelievable and the beaches were beautiful. Thank you Ginny for all the amazing meals you prepared for us. We had such a good time on the trip and will forever enjoy the memories. Cap'n & Chef Extraordinaire! Thanks for spoiling us with smooth sailing and exceptional food. This was a fantastic way to see the BVI. Your familiarity with the area made it all so much more interesting. The food and drink was plentiful and made us feel like royalty. We had a wonderful time thanks to you too! Happy Holidays! We really appreciated the fine experience we had and a great deal of it was due to your outstanding service. Can't tell you enough how impressed we were--I can't imagine a greater crew in existence. You are both very fine people and we have the utmost respect and admiration for your skill and devotion to your craft. I hope to see you again on the CP and if you're ever in Austin, please let us know--you have a place to stay and we would love seeing you. What a fabulous week! Everything was absolutely perfect - from the cocktails to the dinners - from snorkeling to the beachcombing - and everything in-between. Thank you for a terrific time! Truly a memorable week with old friends and now new ones in you both. Ginny...your company and cooking (oh my!!) is without compare. Gord...is there anything you can't do? We're grateful to you both. We will return again and again!! Can't say enough good things about Gord and Ginny. They were professional, fun to talk to, skilled in their own roles, and had a good sense of when to engage and when to leave us to ourselves. They were very safety oriented and knowledgeable about the whole sailing adventure. Gord and Ginny were great with wonderful experience and stories they could share about their travels around the world. They both focused on making the trip enjoyable for us. They made the trip what it was. Awesome. The food was outstanding. Ginny is not just a cook and first mate; she is a true CHEF! The meal presentations were beautiful, the food choices were varied, fresh and interesting. Outstanding cuisine! The sailing vacation was everything we had hoped for and more. We had a fantastic time and would recommend this trip to others. It was very reassuring to receive an email from Ginny prior to departure. She took care of our last minute dietary requests and made us feel that everything was in order for our trip. Ginny and Gord are your most valuable asset in this biz. Highly skilled and attentive to the needs and wishes of guests, we cannot imagine that any charter at any price could match the top drawer service and hospitality they provide. We are referring friends at every opportunity. Gord & Ginny planned our itinerary in a way that met the desires of our group. Because of their superior sailing skills, we enjoyed 3 weeks’ worth of fun and sights in only 1 week. Ginny prepared wonderful meals and snacks, accommodating difficult special dietary requests. The meals magically appeared at the perfect time, just as we were all ready to eat. Best of all the food was both delicious and healthy. Ginny and Gord made this an unforgettable trip of a lifetime for us - our best vacation ever! Ginny and Gord are a delightful and amazing couple. We treasure our special time together and new friendship. This pair is truly your best asset in this business!!! We are referring our friends at every opportunity, so long as Ginny and Gord are crew. Everything was exceptional. Captain Gord and Ginny were amazing guides. They are seasoned Sailors and Gord's expertise with handling the catamaran, his keen eye for weather variations, his expertise on the water, and his diligence in caring for his passengers is exemplary! Ginny's ability to entertain and feed the guests is second to none. She is truly a gifted Chef in First Mate's clothing! Ginny's skills as a Chef are exemplary. She was able to maintain her duties as a First Mate as well as feed the people on board with excellent meal plans and presentation! It is because of Captain Gord and Chef Ginny that we will be back for sure! Their friendliness, skills, attention to detail, and overall love of the BVI made this the most memorable vacation for us! Five Star accommodations are jealous of "The Ginny & Gord Experience". My husband and I had the time of our lives sailing with Ginny & Gord! They are gracious, fun and delightful in every way. We quickly became comfortable with the hospitality and fun atmosphere created by our hosts. Our every wish was scheduled for us as we enjoyed breakfast each morning. Our days were filled with diving, snorkeling, land tours, entertainment and even quiet time to relax under the stars. Their sailing skills are expert and the food was fabulous. Honestly I cannot understand how 2 people could do so much. The level of hospitality and service they provided could not be duplicated by a much larger crew. The BEST crew ever - we have comparisons and have sailed with others. Gord and Ginny were by far the most professional, capable, attentive, and wonderful crew we have ever had the pleasure to know and to sail with. The food was beyond great! Gord’s skills are beyond anything. Their relationship with each other and us was perfect. I can’t say enough great and excellent things about them. I would never want to be with another crew! We had the time of our life sailing with Ginny & Gord! They are expert sailors and navigators. They are also extremely sweet and fun people, as well as very patient with difficult guests. We always had a great time, and we always slept well knowing Gord and Ginny had all of the sailing and navigation under control. Ginny is an amazing and creative cook. She prepares delicious meals with fresh and local ingredients. The crew are both excellent tour guides, and they took us to all of the best spots in the British Virgin Islands.